I honestly CANNOT believe that our sweet baby girl is 6 months old. You guys. That’s 1/2 a year! I can honestly say that everyday with her gets better and better. Her smiles, laughs and adorable personality make my days the absolute best. Yes. I’ve become THAT mom and I’m so proud of it. I would say that over the past month she’s changed the most. She loves to be moving (I wonder where she got that from?! ), is trying out and loving all the solid foods, has switched up her nap schedule a little bit and has started breastfeeding just four times a day. If you are new to following me on here, I’ve been doing baby updates every two months. I know a lot of you find it helpful to compare notes with your little one’s schedules and grab some new ideas for your babe! 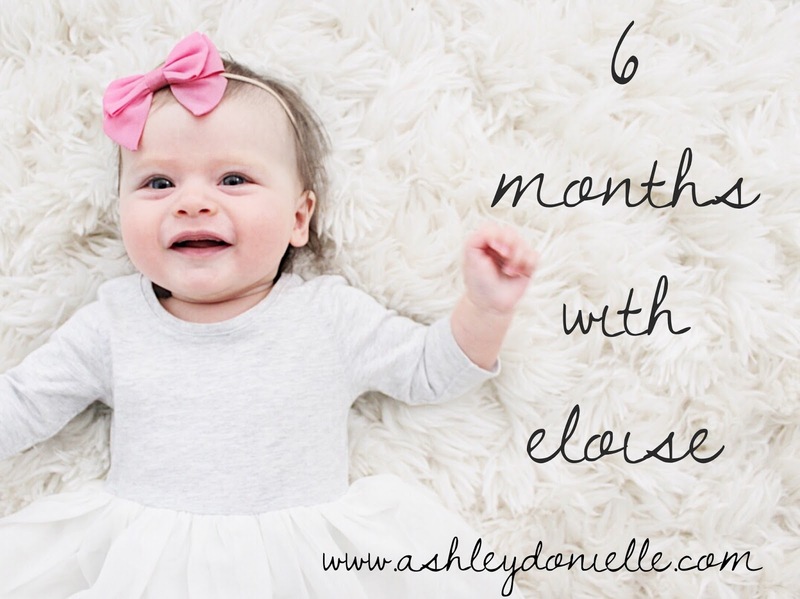 I shared her two month schedule here and her four month schedule here if you want to go back and check those posts out! Now let’s get into her six month schedule & favorites! 8:00 am- 9:30 am: Come downstairs and play on her favorite piano or in her jumperoo, do some tummy time, chat a little bit. 9:30 am – 11:00 am: First nap of the day in her Dockatot inside her crib. 12:00 pm – 1:30pm: Change diaper, run errands (this is when we will either go to the grocery store, post office or get any other errands done). 1:30 pm – 3:00 pm: Second nap of the day (This is when I will try and do a little in-home workout and laundry). (We have been giving her 6-8 oz breastmilk bottle before bed so that we can tell exactly how much she drinks. We’ve found that making sure she has a full belly before bed helps her sleep through the night). 8:30 pm – 9:00 pm: Eloise goes down for the night! (She is currently sleeping in this bassinest next to our bed). – We are still playing with our piano (man, have we got our moneys worth on that one!) and have recently started loving this jungle jumperoo too. -Eloise recently started eating solids and these organic jars of food have been easy, healthy and she LOVES them! She especially loves the sweet potatoes, carrots and mangos. And yes, I buy jar food. Props to all you moms out there who take the time to make their own food. To me, it’s the same thing in the jar, (if you are getting the right ones), for a great price AND I save time! – 4moms recently sent us this high chair and I honestly can’t say enough great things. It’s chic, simple, easy to clean and the tray is magnetic so you can pull it off and on with ONE HAND! GENIUS. If you are pregnant, add this to your registry immediately. You will love it! UPDATE ON 4MOMS HIGH CHAIR: We’ve used it now for about 9 months and can’t rave enough about it. It’s SO easy to clean and the fact that the tray comes on and off with one hand is so so helpful. Worth every penny! You can find it on Amazon HERE. – So many of you guys wrote me and told me I needed these bibs when we started Eloise on solids and I’m so happy I listened to you all. They are so easy to clean! – We are still teething over here and this teether has been her absolute favorite. It’s easy for her to hold and she can really chew on it well. We have the regular Sophie toy too, but she likes this one better. 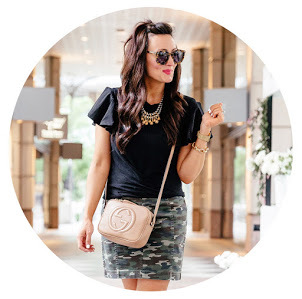 – These are still our favorite headbands but we’ve recently started subscribing to Little Poppy Co. It’s a bow subscription company and you get 3 bows every month. Every bow has been absolutely adorable and I’m loving it so far! (The pink bow she is wearing below is from them and was in our August shipment). Eloise has her six month check up next week and I can’t wait to see where she is on the weight and height scale. Bryan & I love her check up appointments (besides the shots) and we get so excited to see our Pediatrician. Anyone else?! Or are we crazy!? Thanks for stopping by and reading Eloise’s update. I’m so happy that I have the platform to share her growing up with all of you!